A small town in Slovenia in the Alpine area along the Italian border. 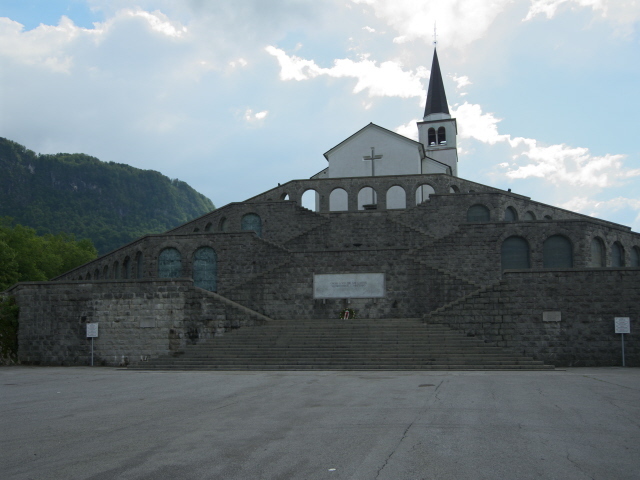 In World War One this was the infamous Isonzo Front and the town of Kobarid is home to an award-winning regional museum about the battles in these mountains and a major point on the Walk of Peace trail along this former front. It is also a good base for further explorations of this area. More background info: Kobarid is an old place, but for most of its history was no more than a sleepy little provincial hamlet … until World War One came along. At that time it was part of the Austro-Hungarian Empire and found itself right on the front line with Italy, which was fighting on the side of the Entente from May 1915. Between 1915 and 1917 the successive Isonzo Front battles that are covered in the town's museum left Kobarid at the heart of it all almost completely destroyed. While the civilian casualties were bad, the military casualties were even worse, especially on the Italian side: some 300,000 soldiers, about half of Italy's total war casualties of WWI, are believed to have died on the Isonzo Front, and about 200,000 on the enemy side, so about half a million in total! “Isonzo” by the way, is the Italian name of the river that gives the valley its name in Slovenian today: Soča. So sometimes you can also read about the “Soča front” here – it's just the Slovenian name for Isonzo Front! After the war, Kobarid fell under the rule of Italy (hence the Italian Charnel House), and was subjected to a policy of enforced Italianization. In reaction to that, Kobarid became a major recruiting source for the partisans of the anti-fascist organization TIGR. Towards the end of WWII, when Mussolini was deposed and Italy surrendered to the Allies and was in turn partly occupied by Nazi Germany, underground partisans first took advantage of the situation in the Kobarid area and liberated it, setting up a temporary Slovenian administration. This was short-lived though and Nazi German forces took over in late 1943 until the end of the war in May 1945, when Yugoslav forces pushed out the occupiers. After WWII, the Kobarid area was briefly under Allied military control under the joint rule of British and US forces, but after September 1947, following the Paris Peace Treaties that settled the fate of the minor Axis countries such as in the Balkans, Kobarid became part of Yugoslavia. This period lasted until Slovenia was the first part of Yugoslavia to break away (eventually leading to the complete dissolution of that state). Since then Kobarid has been part of independent Slovenia. Especially after the country's accession to the EU, tourism has seen a boost in this area as well as in Slovenia as a whole. Right opposite the museum is a visitor centre promoting the Walk of Peace – a trail that roughly follows the front lines from the Alps north of Kobarid all the way down to the Adriatic coast. Some of these locations are also covered by guided tours organized by the museum itself. The visitor centre has plenty of info material, brochures, leaflets and maps that you can pick up, and a small exhibition room with some displays and interactive screens (admission free). In addition, there's also a monumental Italian “Charnel House” (or 'ossuary') on a hill just above the town. 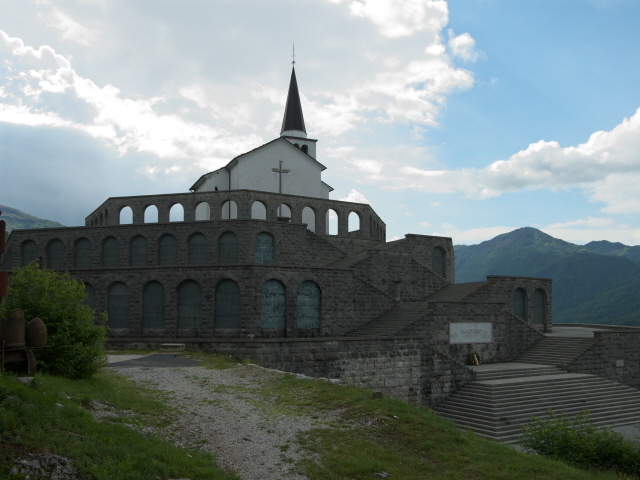 This was constructed around a pre-existing chapel (St Anthony's) during the time that Kobarid was part of Italy. The remains of over 7000 Italian soldiers were relocated here from various war cemeteries in the area and laid to rest here. The Charnel House was opened in 1938 by none other than Benito Mussolini himself. The architecture is fitting for the era – Italian Fascist style. The basic design is one of three tiers of granite arches, the bottom two of which contain the soldiers' grave niches. These are covered with dark-green marble slabs that either state the names of the fallen or the line “500 militi ignoti”, i.e. unknown soldiers. The tiers are connected by wide granite steps leading all the way up to the chapel (which itself is rather plain and unremarkable). The road to the monument is lined with stone sculptures on a quasi-religious theme (like the stations of the cross) that also echo the Italian Fascist style. Set back a bit from the car park by the Charnel House is another one of the many small private museums in the region with enthusiasts' collections of WWI artefacts. Unfortunately, at the time of my visit it was closed, so I can't say anything about its contents. Other than that there isn't much else to see in Kobarid – although I spotted a small plaque on a building next to the church in the village centre that had something to do with the advance of partisans in 1943, i.e. after Italy had “dropped out of” WWII. The plaque, obviously, enough was put up during the times when Slovenia was part of Yugoslavia. Location: in the central part of the Soča valley in the western-most part of Slovenia, just a few miles from the border with Italy. Access and costs: a bit remote and so easiest to get to by car; typical price levels for the region. Details: To get to Kobarid is by far the easiest by driving there yourself. Alternatively there are a few regional buses that connect Kobarid to other small towns in the area and even all the way to Ljubljana, but these aren't really for tourists, though you could give it a try. (Many Slovenians speak good English – or German or Italian – and could help.) The ride from the capital takes ca. three hours. At the bus station take the line going to Bovec (Kobarid is a couple of stops before that terminus). If you have your own vehicle, there are various routes you could follow. From Ljubljana you can first use the E61 heading south and then take the 102 road north-west which will eventually take you to Kobarid from the south-east. If you want to avoid toll roads you can also take the more scenic, but slower route through the mountains north-west of Ljubljana. A sat-nav/GPS would be very helpful in that case. Coming from the north, from Austria, you could use the high mountain Vršič Pass to cross the Julian Alps (on road 206) towards Trenta and Soča village. The pass reaches an elevation of over 1600m (over 5000 feet) in countless switchbacks. It's a demanding but exhilarating drive and very scenic (see photos under Slovenia), but is open only outside the winter snow period – so when going there in spring or autumn do check ahead whether it's open. To avoid the pass you can also go via Italy, from Villach (on the A2) to Tarvisio (more toll roads), then south towards Bovec (on road 203) and from there onwards to Kobarid. Coming from the west, from the plains of Friuli and the city of Udine, take the SS54 road east, then north, which within Slovenia becomes the 102 road heading into Kobarid from the west. For accommodation there are several options in Kobarid, including a full-service hotel (at prices that match those you'd expect to pay in Western countries) or a few B&Bs/pensions and several self-catering holiday apartments. If you're not self-catering, there are also a few eateries in town, including a very decent restaurant in the town's main hotel on the central square. Time required: about half a day for the museum, the Italian Charnel House and the town itself, but if you want to explore the area around more, then plan on at least one night's stopover here. Combinations with other dark destinations: There's plenty more on the topic of WWI and the Isonzo battles in the region. 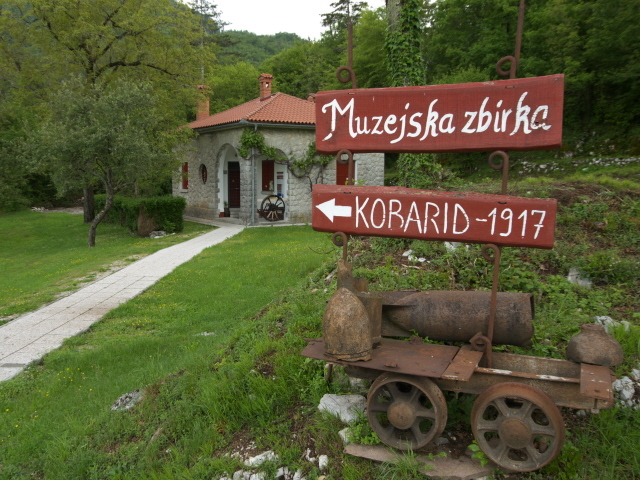 The museum organizes guided hikes and mountaineering tours to various locations with relics from the war in the mountains around Kobarid. And the Walk of Peace trail reaches even further, including various locations across the border in Italy (e.g. at Monfalcone). In total the “walk” is 230 km long (over 140 miles) and leads across some tough and difficult mountain terrain. Doing it all will probably take weeks. If you want to be more selective and less mountaineering-adventurous, there are also a few fairly easily reachable spots such as Kolovrat. Other towns in the area also have their own smaller museums, e.g. in Tolmin and Vipava. Combinations with non-dark destinations: Kobarid is also a centre for very different tourist activities, especially white-water sports such as rafting as well as further outdoor activity holidaying sorts. The Soča River valley is certainly a prime pick in that category. And for those who can do without taking a kayak down its waters it is also just very pretty to look at, with its deep greenish-turquoise hue. Mountaineering and hiking are naturally also popular activities in the area. And the mountain passes to the north (especially the Vršič Pass – see above) are popular with bikers too. In general this Alpine north-western region of Slovenia is one of the country's most scenic parts. In terms of culinary tourism, Kobarid also has a special attraction itself, namely a cheese-making museum at the Planika dairy on the eastern edge of the village. Their speciality cheese Tolminc can also be purchased at the museum/dairy.